** Winner of the British Sports Book Awards 2014 New Writer of the Year **Where there is hope there can be redemption. Meet Adrien Niyonshuti, a member of the Rwandan cycling team. Adrien was seven years old when he lost his family in the 1994 genocide that tore Rwanda apart. Almost twenty years later he has a shot at representing his country at the Olympics. Meet Jock Boyer, the coach of Team Rwanda. One of the top American cyclists of all time, Jock recognises the innate talent for endurance that the Rwandans possess. A man with a dark past, Jock is in need of a second chance. Meet Tom Ritchey, the visionary inventor of the mountain bike and the U.S. money man looking to recover from a profound personal crisis. 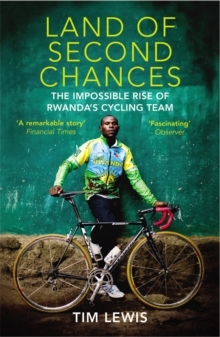 In The Land of Second Chances, Tim Lewis charts the incredible true story of the Rwandan cycling team as they overcome impossible odds to inspire a nation.